Fourteen authors, including Omar Figueras, Lenore Look, and editors Aronson and Bartoletti, write about the tumultuous events of 1968...The book's strength lies in the way different voices and different angles come together into an integrated whole. Fascinating and accomplished. 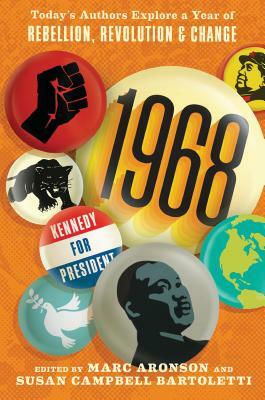 Authors explore the tumultuous global events of 1968 in this anthology...the differences in their backgrounds make for a vivid, dynamic account of the complicated, intersecting politics behind brief accounts in history books. With an approach promoting critical thinking, this collection will likely help illuminate a deeply important year in world history and encourage fresh thinking about our current contentious moment. The book begins with the essays, but points back to scholarship, or into the world itself, in a delightful way. This wide-ranging anthology is useful as both a print symposium on the topic of 1968 and as a source book for further study. Fourteen essays, interspersed with Elizabeth Partridge’s “Nightly News” commentaries, examine events above and below the fold of a most newsworthy year, 1968...it’s the less frequently told stories that set this volume apart. Susan Bartoletti’s lively, resonant take on the protest theatrics of Abbie Hoffman along with David Lubar’s thoughtful overview of the state of stand-up comedy offer perspective on the place of humor, satire, and the absurd in the media.